The Marvel Cinematic Universe may be largely a well oiled machine, but its not without controversies. This can be seen with the state of the Guardians of the Galaxy franchise, as Disney fired director/writerJames Gunn in July, after offensive tweets from a decade ago resurfaced. The plot has further thickened this week, as Gunn is now using his talents for DC’s Suicide Squad sequel. Guardians actor Dave Bautista recently expressed his interest in joining the project, and now you can see what he’d look like as Batman villain Bane. How awesome is that? Dave Bautista’s impressive figure from his years of wrestling make him a prime candidate for the DCEU’s Bane. And considering the actor’s future as Drax is currently unclear, it might be the perfect time for him to jump ship, and nab a role in the DC universe. This awesome new image comes to us from Boss Logic, an artist who regularly crates fan made renderings of live-action comic book characters. Each time an actor is rumored to be taking on a Marvel or DC, Boss Logic ends up creating a new piece. This latest creation imagines Dave Bautista’s hulking version of Bane– if he were to end up joining James Gunn’s newest superhero project. The above poster might look familiar, as it is actually an edit for a previous Guardians of the Galaxy image. Rather than creating a totally new rendering of Dave Bautista, Boss Logic simply did some editing and coloring to bring the actor from Drax to Bane. Either way, he’s a physical presence that I wouldn’t want to meet in a dark alleyway. While David Ayer’s Suicide Squad managed to win an Oscar for makeup design, the villain-centric team up movie largely disappointed audiences when it arrived in theaters in 2016. After a great trailer, the finished product ended up being a bit uneven, despite having moments of brilliance. The pressure is on for James Gunn to deliver a higher quality product, especially after his acclaimed run with the Marvel Cinematic Universe. It should be interesting to see if James Gunn ends up making major changes to the roster of the titular Suicide Squad. While Margot Robbie’s Harley Quinn and Will Smith’s Deadshot seem like obviously choices, Gunn might end up changing up the supporting cast. Some new blood like Bane might breathe life into the franchise, and allow for the director to put his quirky spin on the Suicide Squad franchise. 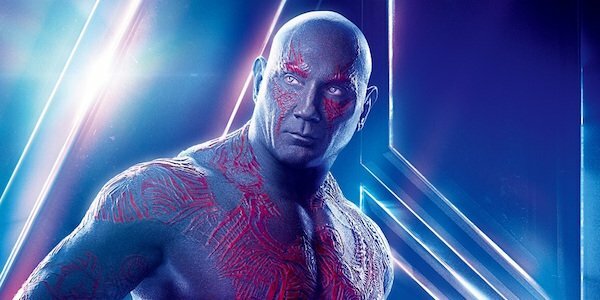 Dave Bautista’s role in the MCU is still a mystery, as he’s technically contracted to appear in Guardians of the Galaxy Vol. 3. But the threequel was been put on pause indefinitely, with Bautista previously maintaining he wouldn’t do the blockbuster without James Gunn’s original draft. There’s been no official word from Gunn or Marvel about what’s next, but there’s certainly a chance that the wrestler turned actor will have a more available schedule soon.